The honest answer is "no," and I am being honest. I want to trust, but I also want not to suffer. However, when you change the frame, you begin to realize how ridiculous it is to think we might weigh in on the almighty. As I learn, I will settle on meantime praise, even when it is occasionally grudging. I am human, and after all, being honest. 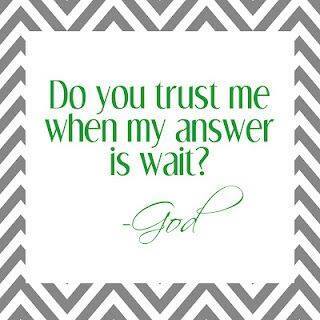 Lord, I trust You, even as I second guess. That is my humanity showing. I do not deny my humanity, even as I work to push beyond its limitations, and I appreciate the tension between humanity and Faith. My challenge is not to allow my humanity, like fear, paralyze me into disobedience or inaction. I choose to say Yes, prayerfully deciding not to be subject to and victimized by my humanity. This choice is not easy. Yet, I choose obedience, and in surrendering to it, choose Joy. I choose to calm my emotions and celebrate the incredible gifts in my life. Waiting will never be easy for me; it is deciding how to spend my meantime that matters.